Minimum 4 people, maximum 10.
iWalkWaiheke are proud to be involved with Oxfam as a participant and also offering a 2 day training walk. 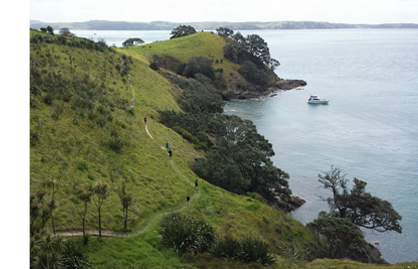 Both days are both approximately 25km of trails linked with some short road walks, but capturing the stunning headlands of the west end of Waiheke on Day 1 and the Te Whau track, Palm Beach, Onetangi Beach and Whakanewha Regional Park on Day 2! Beautiful meals are included, with delicious picnic lunches provided on both days, and a BBQ dinner relaxing in your accommodation, and fresh free-range eggs to compliment your breakfast the next day. Both days will be challenging as it is very hilly. There are essentially no flat bits! You would need to catch the 8.15am Fullers Ferry from Downtown Auckland and return to Auckland on a late afternoon ferry the following day. (Around 5pm). For custom walks including longer walks and/or walking at night please contact us - we are happy to tailor the perfect itinerary. Accommodation (based on double room share), meals, transfers where required to walk start/end points. Not included: transport to/from the island, personal walking snacks, coffee stops, any alcohol and drinks purchased from the vineyards or with meals.